Last week my smallest one was ill which wasn’t loads of fun. After the inital bit of being ill though there’s always that bit in day two or three when they are too ill to go out, not quite well enough to run around in the garden but still in need of doing something. 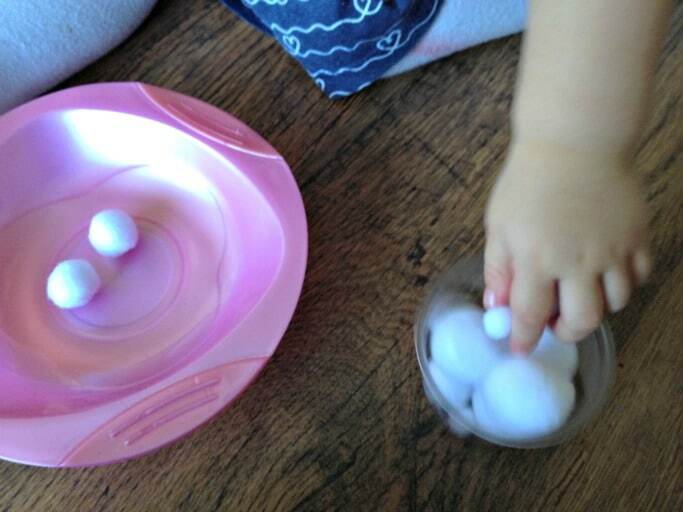 We love sharing activities for toddlers and I did this simple activity for her because it was easy to set up and put away so she could go back and forward to it when she felt like it. It’s something that’s great for fine motor skills too and I was pretty suprised by what she was actually able to achieve. I like to give my daughter more than one bowl to put things in as I know she’s enjoys moving things from one pot to another but I was pretty surprised in that she went straight for the tweezers? I think it’s maybe because it’s her first time playing with them. I was really lucky in that they were exactly the right size for the larger pom poms so (by a bit of a fluke) she managed to pick up one of the pom poms staright away with it. 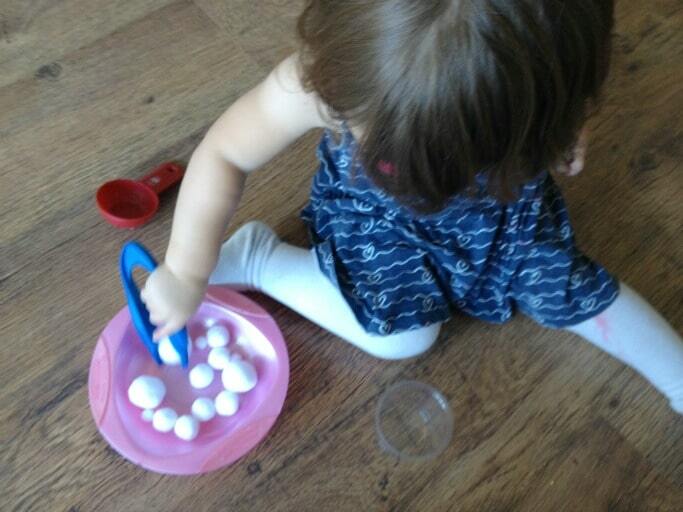 She enjoyed using the scoop and used her fingers as well for moving the different sizes of pom pom into the different pots. I loved that as it was an open ended activity there wasn’t really anything for her to get frustrated about not being able to do, more that it was an opportunity for her to just have a relaxed little play with the materials. It’s also a lot easier to clean up than other toddler activities like painting! 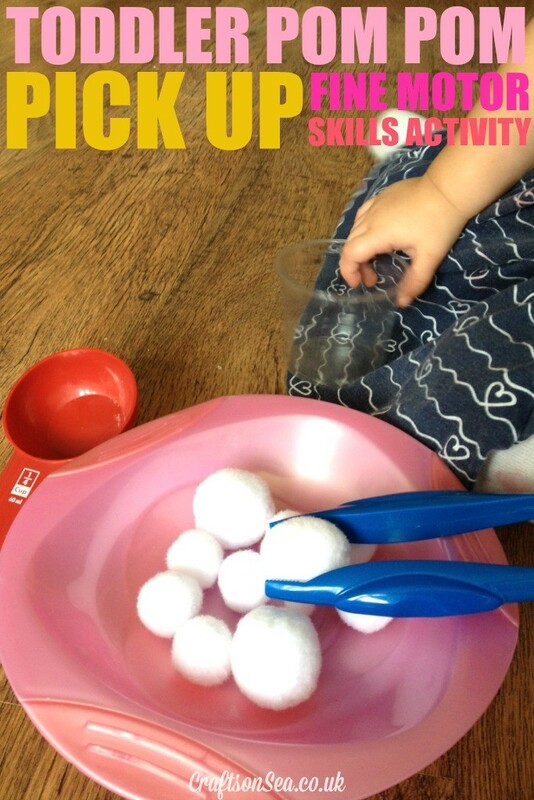 For older kids this activity could also be addapted so that the pom poms could be counted, put in order of size, you could see if your hand, scoop or tweezers could hold the most or you could have a race to see who can pick up the most pom poms the quickest! Follow my Pinterest board for loads more ideas and inspiration!